This story is by Deborah Hoffman, a very concerned citizen that uses here time and resources to help these neglected, sick stray animals in an area near I 59 & W. Little York known as the Corridor of Cruelty. Deborah wrote an article in the March issue of Houston PetTalk Magazine….here is a follow up to that story. Not too long ago, an amazing rescue occurred in the Corridor of Cruelty . It began one day while I was refilling the stray dog feeding stations off of Homestead Rd. I spotted a mange-ridden, emaciated and practically hairless and pregnant female lab mix. 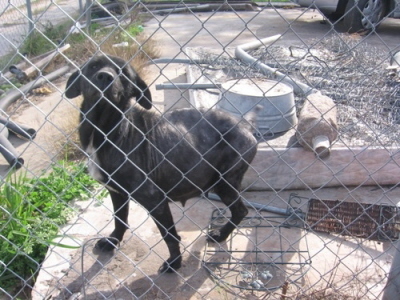 She was imprisoned behind the fence of an Auto Shop and ran sheepishly away from me when I approached her. For two weeks I continued to feed her and gain her trust. The time came to spring her from jail and Patricia Burrows jumped into action. Patricia is an amazing person….. time after time she marches right down the streets of the Corridor and grabs and gets dogs without fear or worry. She knows when a job has to be done and does it. But boy, what she didn’t know was what she was getting into that sunny Saturday afternoon. When she arrived at the Auto Shop to retrieve our mangy, emaciated, momma-to-be, she found her wandering in a field. Not only did she scoop her up but found out that, lo and behold, she wasn’t pregnant afterall. Well, of course not, because “Momma Mia!” had birthed 10 puppies just hours earlier!!! A little boy had collected the puppies and placed them in a cardboard box that Momma could not possibly have gotten into to nurse them. All 9 puppies in the box were soon to be thriving (1 died before Patricia arrived on the scene) and snuggled safe and warm with Momma Mia in a kennel at our vets. Soon after their rescue, Patricia brought Mia and puppies home to foster them. She began supplementing Mia’s milk with dropper feedings at least once daily as Mia was in such poor shape, she worried that the puppies might not be getting enough nourishment. Aloe vera rubdowns, boo-coos of vitamin supplements and boiled chicken and rice were soon daily routine for Mia. But Mia did not improve or show any signs of being comfortable for a very long time. The puppies though, grew fat and at the appropriate time began to eat boatloads of mush and were completely weaned and turned over to Pup Squad’s puppy adoption program. Luckily, an extra special foster named Rebecca was found that could continue Mia’s care post-nursing and Mia was recently spayed. Unfortunately, Mia is strong heartworm positive and will need treatment to kill the worms. Her hair is finally growing back and she is happy as can be in her new foster home. Mia is in the adoption program of PAWS Animal Rescue, Inc. and donations are needed to pay for her heartworm treatment. My husband and I keep seeing abandoned pit bulls and other dogs (2 pits sleeping from exhaustion right next to hwy 59/Crosstimbers/Lee Road. It breaks my heart. I hope someone can do another sweep and look around this area too. This might sound like a silly suggestion, and maybe it has already been done anyway, but has anyone tried posting a bunch of signs telling people how to go about bringing their unwanted animals to area shelters (instead of dumping them in this horrible place)? You wouldn’t believe this, but I know at least one person who had no idea you could bring your pet to an animal shelter if you couldn’t or didn’t want to keep him/her anymore. This wasn’t a stupid person, she just thought that the shelter only takes lost/found animals with no known owner. And she assumed that if you try to bring your own pet to the shelter they just wouldn’t take it, or that you’d be charged a very large fee. 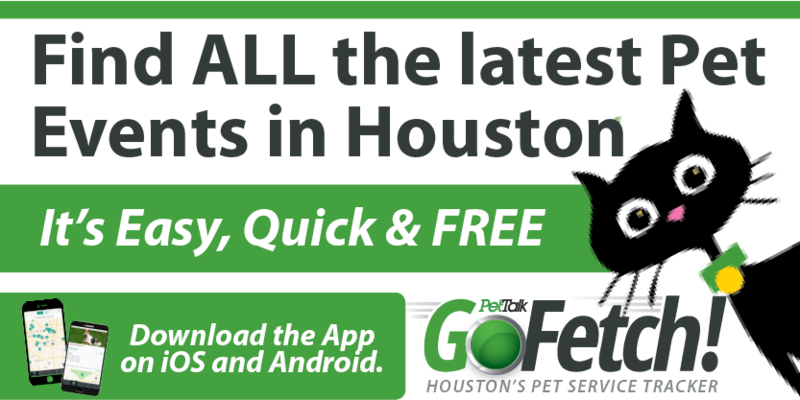 Houston SPCA only charges a small “surrender” fee, ranging from $10-$20 for cats/dogs, or $30 for owner-requested euthanasia ($40-$50 to surrender livestock). Considering what it will cost the shelter to care for or to euthanize the animal, this fee is more than reasonable. If someone is just too cheap to pay that and would rather dump their animal like garbage, then I’m sure nothing will change their mind. But there really are some people who don’t know what to do with their animals that the don’t want or can’t keep anymore. Is there any good way to get this information out to the people who could benefit from it? Thanks for everyone’s hard work! K9safehaven.com I patrol that area and have rescued at least 30 dogs from the Corridor of Cruelty.. some are listed on my website, some have passed. All of their health needs have been met and they are at various stages of recovery. If you are interested in adoption, please visit our website.